A new pet can be a fantastic companion, but sometimes the novelty can wear off (some pets live for a very long time). You may find that regular cleaning, feeding and handling becomes a time consuming chore. Please try to handle and play with your pet as often as possible, you will find that you will be rewarded with a much happier and friendlier pet. If you are not 100% sure that you or your children will be able to give your pet the attention that it needs then please think twice. Lovebirds can make excellent pets. They can be very active with great personalities. If raised and handled properly they’ll be your friends for life. Here are a few tips to get your birds started in their new home. 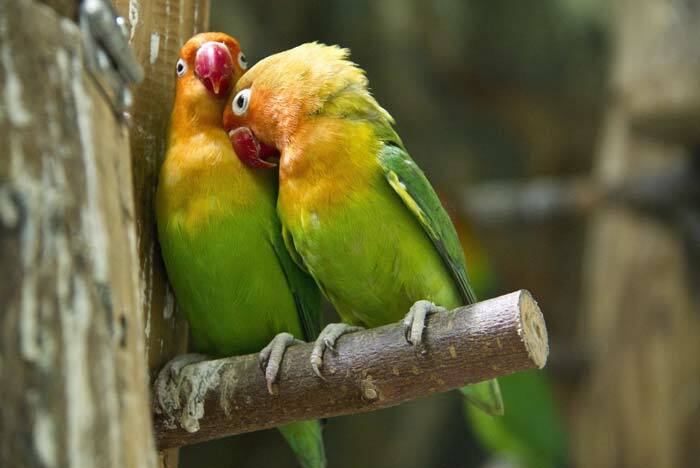 Lovebirds are sociable birds and like to live together with their own breed, do not mix them with any other breeds of bird as they may become aggressive. It’s best to introduce birds when they are young, but they will usually mix at any age. It’s cruel to keep lovebirds in isolation if they are not tame, as they need companions. Lovebirds have a life expectancy of between 15 to 20 years. Check their food and water twice a day, blow off any seed husks and make sure there’s no poo in the food. Clean the cage thoroughly at least once a week with petsafe disinfectant. Make sure you clean everything your pet touches. A cage with two pets may need cleaning twice a week. You can exercise your birds out of their cage if you wish, if you do then please allow them a week to familiarise themselves with the surroundings. Make sure that they are supervised when exercising. When handling your birds their wings should be held close to their bodies. A member of staff will show you how. A few toys are essential to keep them amused. Please don’t overcrowd their cage with them. Always keep them out of direct sunlight and draughts, if kept indoors a steady temperature must be maintained. If housing outside, use an aviary, and acclimatise them to the cold between 1st May to 31st October or they won’t survive the winter. Their claws may need clipping every 3 months to prevent them from getting overgrown and painful. Therapeutic perches are available which can help prevent this. We recommend: Johnsons Bird Clean ‘n’ Safe, Pet Bird Toys, Pet Bird Treats. Do not feed LETTUCE or AVOCADO as these can be harmful. You can give birds very small amounts of fresh fruit and vegetables, but no more than twice a week. Do not keep them near televisions or stereos as these can produce high frequency sounds that will irritate them. Aerosols, hot cooking oils and hot teflon can give off toxic fumes which can be fatal to birds. So keep them out of the kitchen. Lovebirds can get mites and lice in their feathers. There are sprays available to treat this. 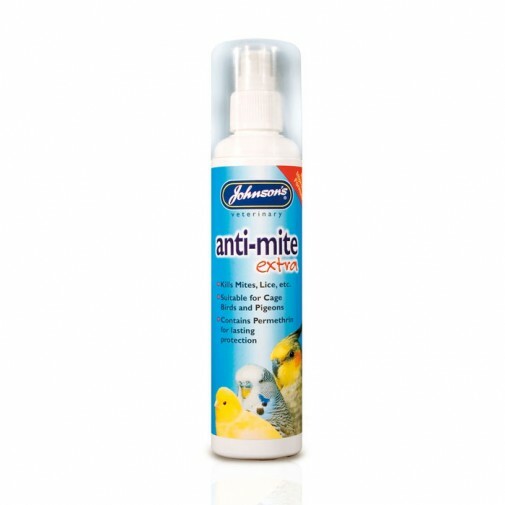 We recommend: Johnsons Bird Antimite Spray Extra. Is underneath the tail clean? Do they have all their toes and claws? Are they clean and not overgrown? Do the legs move freely with no staggering or stiffness? Are the beak and nostrils clean with no discharge or scaling? Is the beak straight and not overgrown? Are the eyes bright and clear? Are all the feathers clean with no bald patches or parasites? Blow in the feathers; the skin should be healthy not red, dry or flaky. Feel the body. Is it fat enough? It should not feel bloated or bony. Listen to the chest. Is the breathing almost silent with no wheezing? If you answered no to any of the above your pets may require veterinary attention. Cage or aviary: Lovebirds need a lot of room. The minimum suggested cage size for 2 small lovebirds is 50cm x 30cm x 48cm. The bars should be no more than 12mm apart or they may get their heads stuck or escape. Cover your bird cage at night so they can sleep in peace. If you choose an outdoor aviary ensure that there is an enclosed sleeping area. Perches: The perches should be 12mm in diameter and should be positioned so your birds can turn around on them without touching the top, bottom or sides of the cage. Make sure they don’t obstruct the feeders. Sand sheets or loose sand: Use either to cover the base of the cage this helps keep the cage clean. Sheets are easier to use in a cage, but loose sand is more suitable for an aviary. Drinker: Position it near a perch. Make sure the spout is wide enough for the birds’ beaks. Change the water daily to keep it clean and monitor their drinking. Feeders: These should be large enough for the birds to fit their beaks in. Food: Lovebirds should be fed complete cockatiel mix. Loose seed that has been bagged in-store is not complete so you’ll need to use nutritional supplements. It is vital that animals are weaned gradually onto any new food. Beak conditioning block: All birds’ beaks grow continuously, beak blocks are essential to keep their beaks trim. Treats: Feed treats every now and then, but not too often. Bird bath: Occasional bird baths are essential for lovebirds to bathe in although some prefer being sprayed. This will help them to preen, there are plume sprays available for this. Toys: Toys are vital to keep your birds active and stimulated.